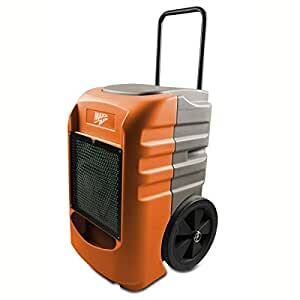 The MaxxAir rotational molded portable commercial dehumidifier is your solution for removing excess moisture from large areas such as a basement or humid, damp rooms in a home or commercial area. This dehumidifier efficiently removes 145 pints of moisture per day and features an automatic water pump with hose for easy water disposal. Our unit does not involve any kind of installation – just position the unit in the center of the room, plug it in, program your settings, and it’s ready to go to work. Designed with portability in mind, our dehumidifier can be moved from location to location using the built-in wheels and telescopic handle. Features include a rugged, lightweight rotational molded construction, 12-Inch tires, a carbon air filter intake, a low-grain r410a refrigerant, electronic control panel with programmable relative humidity and temperature operation settings with an hour counter, and an automatic water pump that includes a 25-foot hose for convenient water disposal. Removes 145 pints of moisture per day (at 90 degrees, 90percent rh, 75 AHAM).